“If we somehow are very close to the 200K mark, and there is still several days to go, we’ll add a Dreamcast reward tier for people that only want the dreamcast version. [Original Post] I’m sure many of you retro gaming fans have been aware that the N64 3D platformer, 40 Winks, recently got a chance at finally being released – some 19 years after it was originally meant to come out on the system. The game was originally released on the PS1 back in the day, with an N64 version planned, coded and… cancelled when its publisher, GT Interactive, went under. GT Interactive was bought out by Infogrames, but they, for whatever reason, decided not to released the N64 version of the game. Roll on 19 years and Piko Interactive (a developer specialising in new games for old systems) acquired the license and original code for the game, and launched the Kickstarter. It has been going on for some 15 days and has already smashed its original goal of $20,000 (£14,329), meaning the N64 will finally be seeing this lost title. But why is this news to SEGA Nerds everywhere? 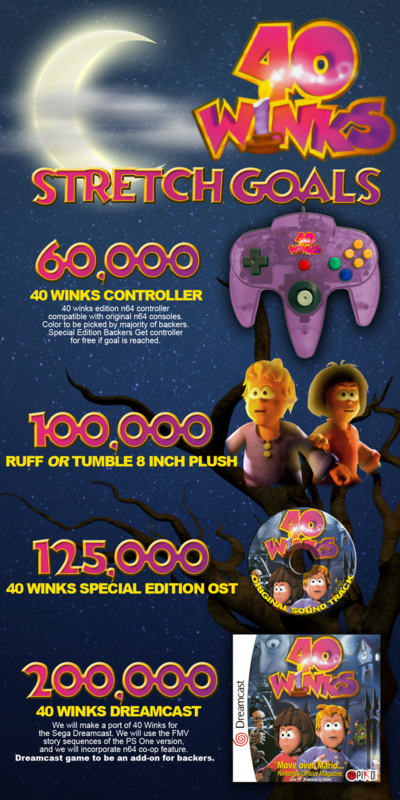 The downside is that the stretch goal has been set to $200,000 for the Dreamcast version, which is 10 times higher than the original N64 goal. However, this is understandable, as the team already had the code for the N64 version and the funding was to help with production of the N64’s costly cartridges among other things, while the Dreamcast version will need to be coded natively for SEGA’s system (which costs a lot more money). The good news is that the campaign is about halfway through its lifecycle (15 days remaining), but it is also just over halfway funded ($108,000) to achieving that $200,000 stretch goal – so it is wholly possible for them to hit this goal. So, if you fancy playing a new/old 3D platformer for the Dreamcast, you might want to hop on and back this project. You will notice there is not a specific ‘Dreamcast Pledge’, but that’s because the team has said that the Dreamcast game will be “an add-on for backers” which I believe means that if you back any of the N64 cartridge versions, you should also receive (or get the choice to receive) the Dreamcast version as well (I’ve asked for confirmation on this). [Update] Piko has confirmed: “It would be an add on, as it you would be able to add it to your reward, by increasing the pledge for an extra amount! If we reach it, we would give instructions on how to do it etc.” (see top of post for full update).